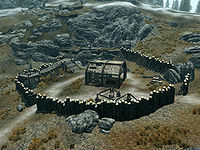 Halted Stream Camp is a small iron mine and cavern located just northwest of Whitewatch Tower (north of Whiterun). It has become a base of operations for poaching bandits. It has an exterior outpost overlain with a wooden fort and one interior zone, Halted Stream Camp. The camp is surrounded by a palisade wall, with the north side protected by a rocky hill. There is a gap in the palisade to the east with a rope strung set of bone chimes blocking quiet access. There is also an unlocked gate in the south wall. The bandits are poaching and butchering mammoths here as evidenced by a shack with a mammoth's skeleton. Four bandits keep watch over the camp, using raised platforms around the perimeter. One on a raised platform to the southeast, one sat on a bench next to the campfire, one sat on a chair on a raised platform to the southwest and the final one is normally on the highest level above the main entrance to the mine, to the north. On this level is also a grindstone and two barrels with two woodcutter's axes leaning against them. Entering through the eastern gap there is a wood chopping block on your right and a ramp up to the first platform on your left with an apprentice-locked chest underneath. In front of you is the shack used for butchering their kills. The shack only has a wall to the west with the other three completely open. There is a tanning rack by the wall and to the right is a long wooden table. On the table is a mead barrel, an iron dagger, a mammoth snout and a wooden plate with grilled leeks and an eidar cheese wedge. There are several mammoth bones in the shack and hanging from the eastern roof strut is a rabbit. To the north of the shack is the campfire with two benches around it. To the west is the second much larger platform. 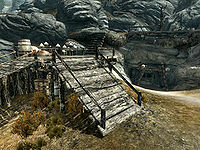 This platform has a ramp that leads to a junction with a barrel and several sacks, turning left over a bridge to a lookout point and to the right, up some steps to the highest level. The mine entrance is on your right at the bottom of the ramp and under the ramp is an apprentice trapped chest and two barrels; on one of these are two potions, a potion of minor healing and a leveled potion of health. The potions don't seem to respawn. The trap activates a swinging mace. Upon entering there is a well lit, wide tunnel leading down to the north. There is a pressure plate that activates a falling boulder trap about half way down before reaching the first iron ore vein. There is a crate on your right with a pickaxe and lockpick on top of it. To your left is a cart containing three mammoth tusks and a mammoth snout and growing beside it is a fly amanita fungus. Ahead you will see a bandit mining who carries a key to Halted Stream Mine. 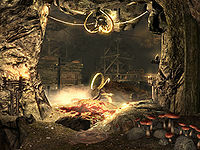 In this area there is a white cap, a bleeding crown and another fly amanita growing on either side of a tunnel that is blocked by a novice-locked gate that can be unlocked by using the mine key obtained from the bandit. The tunnel heads further down to the east. To the right of the gate is a stack of barrels and crates with a pickaxe on top. There are two more iron ore veins on the ground and one at the end on the wall, a barrel with a bear trap on top and a table holding a bottle of Nord mead, a potion of minor stamina and a potion of minor healing. Descending through this much narrower tunnel will take you past a total of six iron ore veins, one on each wall and three on the ground. Past a bleeding crown fungus and a fly amanita fungus you come to the top of a wooden structure with a path to the right descending down a ramp to the mine floor. There is a large pile of sacks along the edge in front of you and on your left a string of bones chimes hanging from the ceiling and a bench. Following the path to the right, on your right is a long wooden table. On the table is a small coin purse, a coin, a lockpick, a flute, a potion of minor stamina, a potion of minor magicka, a random potion, two bottles of wine, a bottle of Nord mead and a copy of Brief History of the Empire, v1. To the left of the table are more sacks, another barrel and on the wall is an iron ore vein. The ramp down heads to the northeast. Bandit #1: "Gotta have a sharp axe to cut through all that fat..."
Bandit #2: "Hurry up with it, we've got a merchant in the pit to take care of after we carve this thing up." To the north is a raised area with a ramp. At the top of the ramp on the left is a single bed, a boss level chest and a large pile of sacks. At the foot of the bed on the wall is a corundum ore vein. 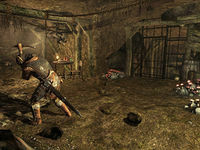 Against the north wall of the mine is a long wooden table containing a piece of iron ore, a piece of silver ore, a potion of strength, two bottles of alto wine, a potion of healing, a potion of health, a potion of minor healing, a random potion, an iron dagger, two bottles of Nord mead, a draught of strength, a large coin purse, a copy of Report: Disaster at Ionith and a spell tome Transmute Mineral Ore. To the east, against the wall is a dresser with an iron sword on top and a set of shelves containing a copy of The Ransom of Zarek, Biography of Barenziah, v3, Brief History of the Empire, v2 and The Cake and the Diamond. There is also a pair of leather boots, three pieces of iron ore, a bottle of alto wine, a random potion and a potion of strength in the area. Underneath the raised area, to the right of the ramp is an iron ore vein. In the middle of the room is a dead mammoth next to a grindstone. The mammoth can be harvested for another snout. There are oil lantern traps strung all over the ceiling. There is a tunnel to the southeast with two iron ore veins on your immediate left. There are two fly amanita fungi in the tunnel. Be careful as this tunnel is full of a variety of traps. 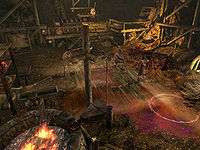 There is a pressure plate that activates a battering ram trap made from the skull of a mammoth, a string of bone chimes hanging from the ceiling, a bear trap on the ground on the left and an oil lantern trap that is activated by a tripwire. Further towards the exit is a third iron ore vein on your left. The exit takes you outside to a spike pit with several mammoth bones, three coin purses, one large, one medium and one small, a dead High Elf and a dead deer. The mine contains an unusually high 16 iron ore veins and 1 corundum ore vein. One on the floor right after the pressure plate, to the left. Two on the floor in front of the barrel with the bear trap on top of it. One on the wall at the end of the tunnel. Six in the tunnel after the gate: three on the floor, two on the right wall, and one on the left wall. One at the top of the ramp next to a barrel on the wooden platform in the last room. One on the floor at the foot of the ramp, next to the oil spill. One under the platform that holds the bed and boss-level chest, to the right of the ramp as you look up them. The corundum vein is on the wall at the foot of the bed, near the boss-level chest. Two in the tunnel right next to the pressure plate. One near the end of the rear entrance, on the floor along the left wall. 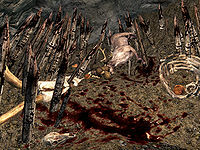 The Poacher's Axe can be found on one of the bandits in the mine. It can be used to chop wood and has a unique enchantment. It is possible (with a bit of care so as not to land on the spikes) to enter the mine via the pit trap, thus allowing you to complete everything the other way round. This is a good place to retrieve a mammoth tusk for Ysolda or Madesi, as the bandits have already killed mammoths using nearby pit traps. There are five in the main chamber and three on a cart in the first hallway. The spike pit is a good place to practice restoration as you can lower your health quickly in a more controlled environment than in combat. Attempting to fast travel from the pit trap may cause the game to crash. Sometimes, the veins will respawn, but the bandits won't. This page was last modified on 7 January 2019, at 04:39.